With Saturday’s execution of an Islamist defendant, the first state killing of the hundreds of people sentenced to death in mass show trials following the July 2013 military coup, the US-backed Egyptian junta is stepping up its campaign of police-state terror against the people. The junta chose to begin the executions with a defendant, Mahmoud Ramadan, who was personally involved in a gruesome crime: the killing of a young man in the Sidi Gaber district of Alexandria during mass protests against Egypt’s Islamist president, Mohamed Mursi, in the run-up to the 2013 coup. It doubtless calculated that the selection of such a target would lend a veneer of legitimacy to its show trials and summary death sentences handed down over the last year. Ramadan was one of a group of Islamist thugs who assaulted the teenager, who allegedly had thrown rocks at pro-Mursi protesters, and threw him off of a roof—a crime that was captured in a widely-viewed online video. In the video, Ramadan has a black flag inscribed with the Shahada, the Islamic profession of faith—a flag often associated with Al Qaeda. However heinous the Sidi Gaber murder was, the Egyptian junta of General Abdel Fattah al-Sisi has no political standing to execute Ramadan. It is guilty of far greater crimes against the Egyptian masses, carried out with the support of Washington and the major European powers. After overseeing countless acts of violence against protesters under Mursi prior to the July 2013 coup, the army shot thousands of peaceful protesters opposing the coup in the streets of Cairo and other cities. In killing Ramadan, the junta’s purpose is the same as in its murder in January of 18 protesters as they marched on the fourth anniversary of the toppling of US-backed Egyptian military dictator Hosni Mubarak. It aims to prevent a renewed revolutionary upsurge of the working class against the military through sheer police terror, making it clear that all political opponents face a potential death sentence. Ramadan’s trial was a mockery of justice. According to court documents, Ramadan was found guilty of “killing a child by stabbing him and throwing him off the roof.” He was condemned to death in May 2014, a sentence subsequently upheld by Egypt’s Grand Mufti Shawqy Allam, as required by Egyptian law. The ruling apparently relied on Ramadan’s televised confession following his arrest by the military in which he acknowledged his involvement in the crime. However, Ramadan later admitted only to stabbing the youth, denying that he had thrown him from the roof of the building. The online video does not show Ramadan throwing the youth off the roof. Ramadan’s lawyers therefore requested that prosecutors provide evidence to prove their client’s involvement in the killing. The prosecutors and the judge simply ignored their requests. The Arab Organization for Human Rights (AOHR) also condemned the ruling. “The court viewed fabricated evidence and refused to look into evidence that denies the charges from the defendants,” it declared. The counterrevolutionary terror of the Sisi junta relies above all on the support of Washington and its imperialist allies in Europe, who have maintained a deafening silence on Ramadan’s execution. 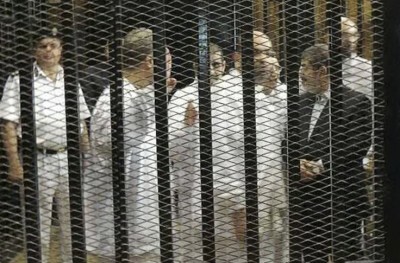 They gave the green light for the mass death sentences last year, handed down in summary rulings issued after show trials of alleged members or supporters of Mursi’s Muslim Brotherhood (MB)–529 in March 2014, 683 in April, and 185 in December. Though the mass death sentences fell primarily on a right-wing Islamist movement, their political target was the continuing opposition of the working class, the leading force in the revolutionary struggles that broke out four years ago in Tunisia and Egypt. Between the July 2013 coup and the first mass death sentence in March 2014, the junta attacked waves of strikes and protests that culminated in a strike by workers at textile factories in Mahalla. The junta feared broad popular opposition to its dictatorial methods and free market measures, such as the slashing of food and fuel subsidies for working people as demanded by the International Monetary Fund and the imperialist powers. The subsidy cuts were ultimately introduced by Sisi last July. Washington and its European allies piled on their support for the Sisi junta as it rained down social cuts and death sentences, rewarding Cairo with ever-closer ties and growing military supplies. The Obama administration delivered Apache attack helicopters to the junta after the March 2014 death sentences and greeted Egyptian Foreign Minister Nabil Fahmy when he visited Washington the day after the April death sentences. Former British Prime Minister Tony Blair became a top advisor to the Sisi junta in July, and France’s Socialist Party government signed billions of dollars in weapons contracts with the junta in Paris shortly before the announcement of December’s mass death sentences. The role of the Sisi junta as a counterrevolutionary agent of imperialism across the entire Middle East has emerged ever more clearly. Its targeting of Islamists to justify counterrevolutionary violence at home aligned it with the deepening imperialist intervention in the Middle East against the Islamic State (IS) militia and its regional proxies after IS victories in Iraq and Syria last spring. The Sisi junta has been increasingly integrated into imperialism’s military operations against Islamist militias across the region. As Western military forces began deploying troops back to Iraq and bombing the country, Egypt bombed areas of Libya held by Islamist guerrillas since the 2011 NATO war that toppled the regime of Colonel Muammar Gaddafi. The bloodletting across the region is dragging Egypt itself deeper into conflict, as the junta faces threats that Islamist groups or domestic militias will retaliate against its show trials with armed struggle or terrorist actions. “The reply to Ramadan’s execution is an uprising and the [declaration] of jihad,” said Mohamed Galal, a leader in the Islamist Salafi Front. Egyptian press outlets cited statements by political movements, such as the Popular Resistance in Giza and Revolutionary Punishment, vowing to avenge Ramadan’s execution.